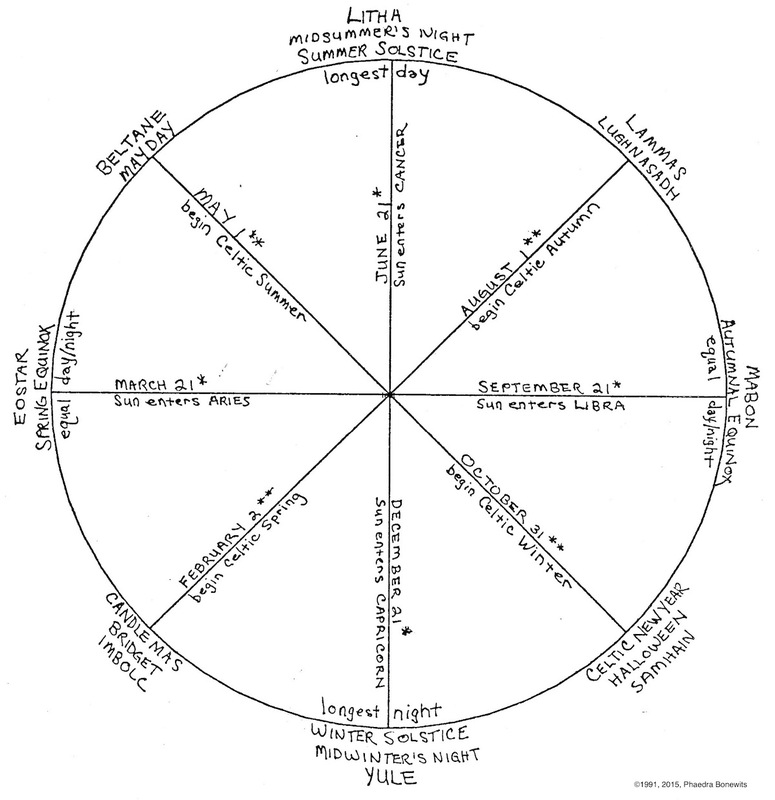 The Wheel of the Year is the name given to a cycle of eight seasonal festivals spaced approximately every six weeks throughout the solar year. These celebrations are also known collectively as Sabbats, High Days, the Eight Great Festivals, the Greater and Lesser Sabbats, the Quarter and Cross-Quarter Festivals, or other names depending on your tradition. The equinoxes are days when day and night are the same length—equal. From Spring/Vernal Equinox onward, the days get longer and the nights shorter until Summer Solstice, which is the longest day and shortest night of the year. In far northern or southern latitudes, the sun may never totally set. After Summer Solstice, the days gradually become shorter and the nights longer until Fall/Autumnal Equinox when they are again equal. The nights then become longer than the days until Winter Solstice, which is the longest night and shortest day of the year. The Solstices and Equinoxes are in some traditions called Quarter festivals, or the Lesser Sabbats. These in-between-solar-events festivals are often called Cross-quarter Days, or the Greater Sabbats. As you can tell from their various names, this second group of holidays has strong roots in Celtic and British cultures. The cross-quarter days were the traditional dates in Britain for collecting rents and taxes and other quarterly activities. Many people observe cross-quarter days starting on the night before. In the Celtic calendar system from which they were originally derived, the new day started not at dawn or at midnight but at sunset the night before, similar to the Hebrew calendar system. For one holiday, Hallowe’en or Samhain (SOW-when), the eve is observed by Pagans while the next day, All Hallows, is ignored. The solar holidays are not always named, although Winter Solstice is also known as Yule and Midwinter, and Summer Solstice as Midsummer. Spring Equinox is increasingly popular as Ostara, but that is as much a back formation from the link between Easter and the equinox as it is a known date for a festival of the Germanic vernal Goddess Eostar/Ostara. Summer Solstice and Fall Equinox are also known as Litha and Mabon, but those names are completely ahistorical; they were first applied to the festivals in the 1970s by Aidan Kelly, who thought it would be more aesthetically pleasing if all the Sabbats had Celtic names (although Yule and Ostara are clearly Germanic). Although there are Celtic heroes and observances using those names that happened vaguely around the same dates, there is no historical evidence of those names being applied to Summer Solstice and Fall Equinox before Aidan Kelly did so. But the new names caught the attention of Oberon Zell, the editor of the influential Pagan magazine Green Egg, who liked them and popularized them. Such is how modern ancient Pagan traditions are born. There is also no record of any Pagan religion before the modern era observing all eight holidays, although there is evidence that each individual holiday was celebrated by some group at some time. The Celts, for example, observed only the cross-quarters until the Romans introduced solstice observances; some regions celebrated either Summer or Winter Solstice, but not both. The equinoxes were the least observed of all. Though all were celebrated somewhere, at sometime, by Pagans, the cycle of eight that we call the Wheel of the Year is a modern invention. But even if there is no precedent for observing all eight as an integrated system before the 20th century or so, it’s a good, workable Wheel. And it’s especially nice because the Wheel of the Year provides the perfect reason to have a good party every six weeks! This entry was posted in Pagan Stuff and tagged Did you know, Neopagan, Wheel of the Year. Bookmark the permalink.